As I said in my last post, I am preparing for a Christmas fayre at St Oswald’s Hospice. The big day is tomorrow! Unfortunately, I have to work, but my wonderful mum is stepping in to man the stall. My stock is complete, but I had time today to use a die I’ve not played with before and have made another little collection. Die cut 2 winter scenes from white card, and two from AS. If you find it hard to stick down fiddly die cuts, you can put double sided tape on the back of the piece of card to be cut, then simply peel it off when you’re ready to stick it down. Cut two white squares and two from AS measuring 850x850mm, 900x900mm, and 950x950mm. 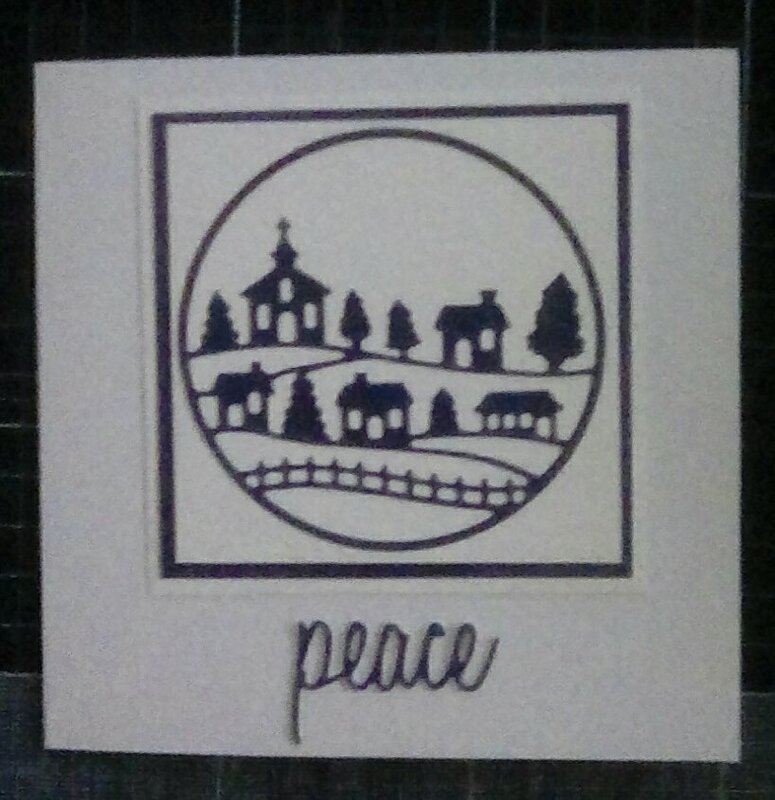 Stick a white die cut to one of the smallest white squares and one of the smallest AS squares, and an AS die cut to the other two smallest squares. Layer up the small squares wuth the contrasting colour medium square, then large. 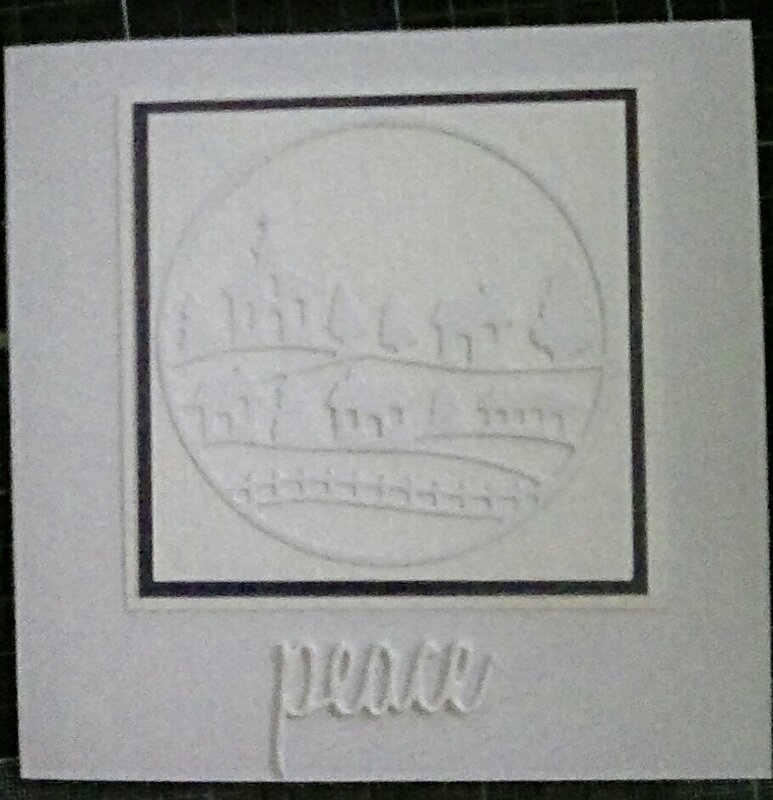 Die cut ‘peace’ four times, twice in white, twice in AS, then ‘on earth’ once from white, once from AS. I wanted a bit of depth, so I put double sided sticky foam on the backs of mine before I cut it. Stick one of the layered squares to each card blank, central and around 150mm down. This entry was posted in cards, craft and tagged Christmas, die cutting on November 25, 2016 by Isn't She Crafty. I apologise for how long it is since I last posted, I’ve not really got an excuse other than busy life and poor mental health; I’ve still been making cards and crafting has been a fantastic form of therapy. The local hospice near me is St Ostwald’s Hospice. I’ve lost lived ones to cancer, as have so many others, and I’ve spent time as a student working in a hospice and saw first hand the work they do. 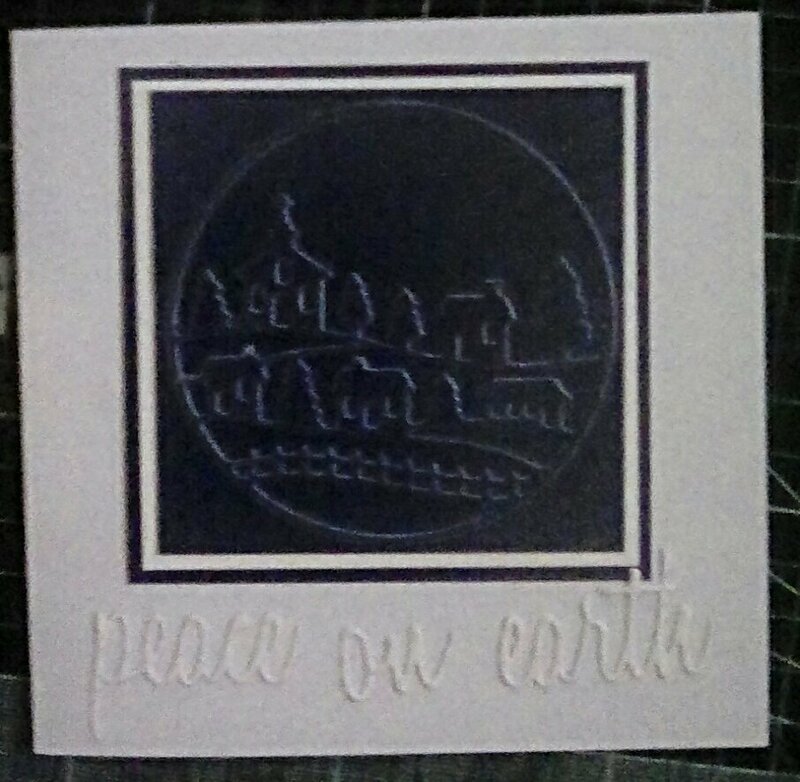 I have taken a stall at the St Ostwald’s Hospice Christmas Fayre and have been making cards to sell there. I love individual cards, but when selling ii feel it’s nice to offer sets of cards which share a theme, and that is what I have created here. As I knew I was batch making, I used my Scan’n’Cut to speed up cutting. I cut all of my mats and layers first so I could stick everything quickly. 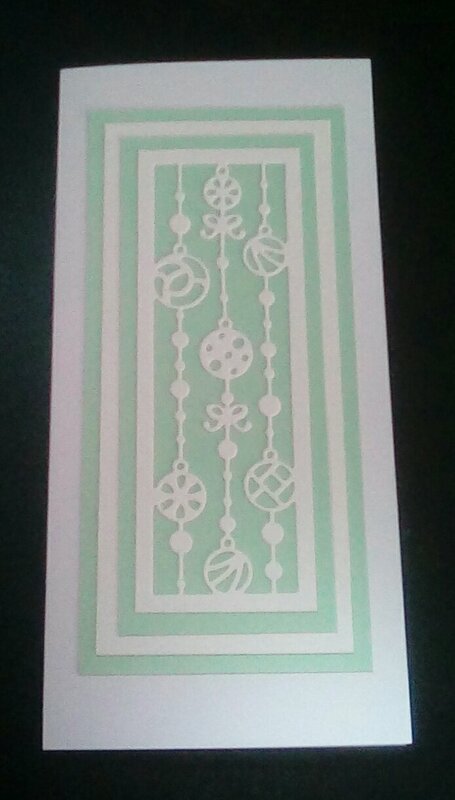 Cut four rectangles measuring 50×143 mm and four measuring 70×163 mm from white hammered card. 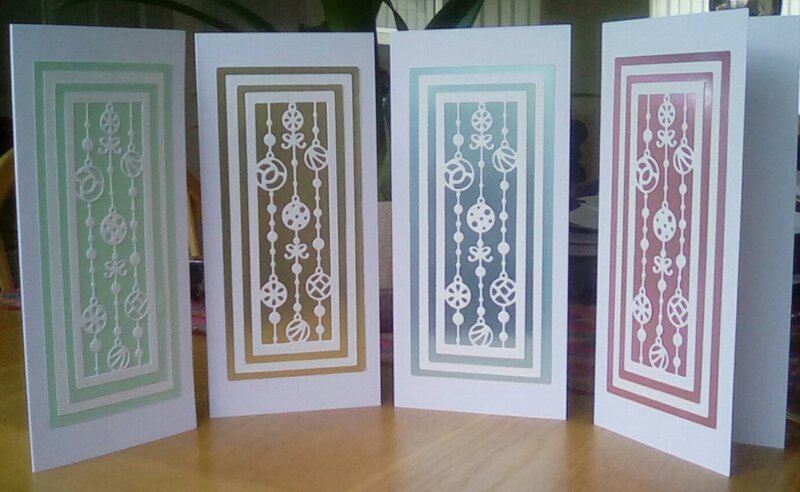 Cut one rectangle measuring 60×153 mm and one 80×173 mm from each of four colours of ‘luxury’ card (this is where I used my satin board and subtle pearlescent). Die cut the falling bauble screen from each of the smallest white rectangles. It will stay in the cardstock. My measurements left a 5mm border all around. I found it easiest to fasten thgthge die down with low tack tape because I needed a precise border. Attach the die cut to the smallest coloured rectangle. I used Cosmic Shimmer for this as it has a great precision tip and sticks firmly, but I’ve got that little bit of wiggle room to make sure the 5mm border is accurate. Attach the coloured rectangles to the largest white rectangles. 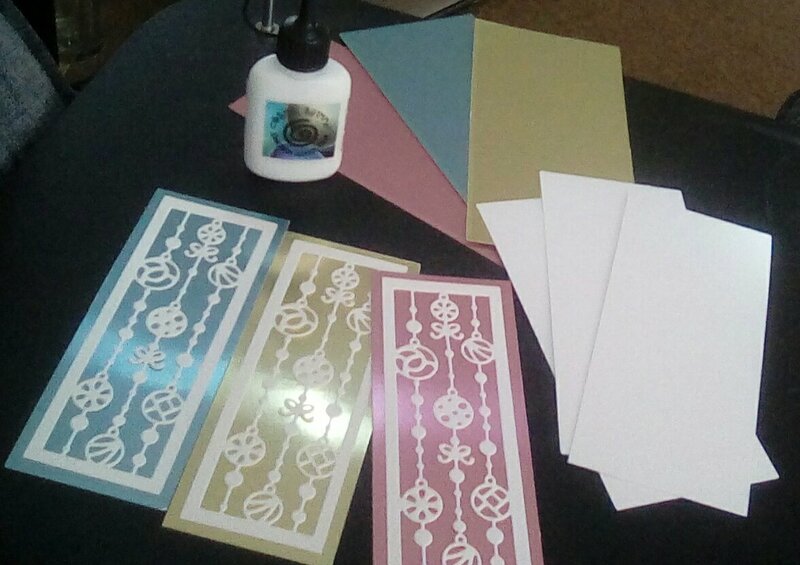 I used Pritt Stick for this; it’s cheaper than Cosmic Shimmer, sticks firmly and let’s me wiggle for the accurate border, but you could also easily use double sided tape. Stick your white rectangles onto the final coloured rectangles, again with a 5mm border all around. Finally, stick the topper you’ve created into the centre of a DL card, in a portrait orientation. This entry was posted in cards and tagged Christmas; die cutting on November 20, 2016 by Isn't She Crafty.